This chest of drawers consists of a solid mahogany top with brass edging leading down to two short over three long drawers. 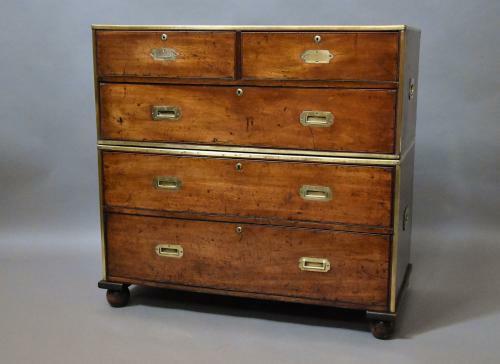 The two shorter drawers each have one recessed military brass handle, the longer drawers having two and the drawers are camphor lined. The chest splits into two sections with brass edging to the top, sides and bottom of the top section and to the top and sides of the lower section, there are two recessed brass carrying handles to each side to make transportation easier. This leads down to the base with a moulding above the front feet leading round to the side and the chest is supported on four bun feet.